Summary: Learn how to install low voltage spotlights and the safety considerations when wiring low voltage spotlights. Low voltage lighting is becoming increasingly popular, as it is long lasting and energy efficient. A transformer is used to reduce the mains voltage to just 12 volts. Another advantage with low voltage lighting is that the risk of an electric shock is minimal on the low voltage side of the transformer. However, as with all jobs involving electricity, safety is paramount and there are some important points to remember. As mentioned above the risk of an electric shock on the transformer side of the circuit is slight, but remember the transformer is connected to the 230 volt mains supply and therefore must be treated with great caution. When positioning low voltage spotlights in a ceiling with floorboards above ensure there is at least a 130mm (5 in) gap between the ceiling and the floorboards to prevent the risk of overheating. When fitting low voltage lighting in an upstairs room, clear away any insulation material from around the light fittings. 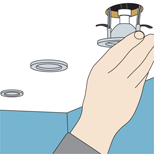 Similarly when lighting a loft conversion, the roof insulation must be removed from around the light fittings. 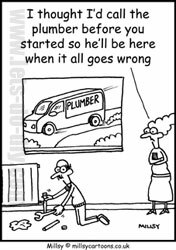 Always read the manufacturer's instructions carefully as the installation process may vary for different light fittings. Plan the position of the light fittings locating them between two joists. Mark the position of the light fittings on the ceiling. Draw circles the diameter of the fittings, which will be about 57mm (5 ¼ in). Cut off the power supply at the consumer unit and remove the fuse or switch off the MCB (miniature circuit breaker). Use a power drill with a hole saw attachment of the same diameter as the spotlights to cut out the holes. An alternative method is to drill holes to accommodate a padsaw blade and carefully saw around the circle. You will need to run a length of 1mm2 two-core-and-earth cable from the nearest ceiling rose to the first light. After removing the bulb and light shade, dismantle the rose and unscrew its baseplate. Before disconnecting the cores note which terminal they are connected to. Prepare both ends of the cable and the cores, and sleeve the bare earths in a green-and-yellow sheath. Connect the three cores of the existing length of cable to the terminal block. If using a double-insulated terminal block there will be no earth connection, so the earth core is connected to a 5 amp strip connector. Connect the spur cable to the rose: live core (brown) to a spare terminal in the central block next to the other live cores (red); neutral core (blue) to a spare terminal next to the existing neutral cores (black/blue); earth core to the earth terminal. Connect the other end of the spur cable to the transformer via strip connectors. Use a connector strip for each core, connecting lives at each end of one strip and neutrals in another strip. Insert the transformer into the hole, and position it at least 100mm (4in) from the first light fitting by gaining access to the ceiling void from above. Connect the wiring harness to the transformer output terminal. Feed the pre-wired leads on the harness through the holes so that each light fixture is supplied by a lead. You may need to drill holes in joists in order to do this. Connect the spotlights to the leads on the harness and engage the clips to secure them. Fix two spring clips on each spotlight to secure the lights in the holes. Push a halogen bulb into the spotlight socket until the ring clip clicks closed. 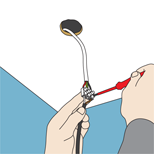 To replace a halogen spotlight, use pliers to squeeze the ring clip and release the bulb. Always replace an old bulb with one of the same wattage. Reconnect the power at the consumer unit and check that all the lights are working. 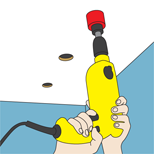 Use a power drill with a hole saw attachment of the same diameter as the spotlights to cut out the holes. Connect the spur cable to the transformer via strip connectors. Use a connector strip for each core. 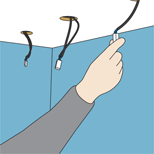 Feed the pre-wired leads on the harness through the holes so that each light fixture is supplied by a lead.